With thousands of fighting game players in attendance, EVO not only is the biggest fighting game tournament in the world, but also the biggest gathering of the fighting game community. Tons of side tournaments, grudge matches, gaming personalities, and game demos can be found at EVO. For EVO 2015, Mad Catz and XSplit are partnering to give you a glimpse into what can be found if you attended EVO 2015. The XSplit team will broadcast a variety of side events from the Mad Catz booth at EVO 2015. Some highlights include the epic grudge match between Meltdown Luffy and Yubiken Super Santarouman in Ultra Street Fighter IV, Tekken 7 action, finals for the 3v3 Arc Revo Qualifiers, and much more! You can find the full schedule here. All the action will be broadcast on the Mad Catz Twitch channel, so make sure to follow the channel to know when it goes live. Aside from watching all the action at the Mad Catz booth, make sure to follow both XSplit and Mad Catz on Facebook (/MadCatz and /XSplit) and Twitter (@MadCatz and @XSplit) for chances to win a variety of prizes. What if I am at EVO 2015? If you're at EVO 2015, we've got you covered! 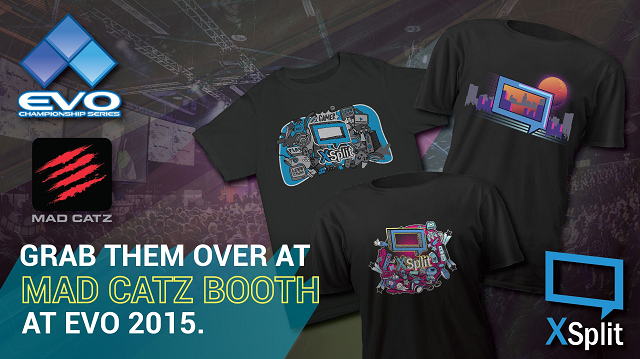 Stop by the Mad Catz booth to get some free XSplit swag. Check out the image below to see what will be available in limited quantities!